Broken electricity poles and streetlights lie in the middle of highways. 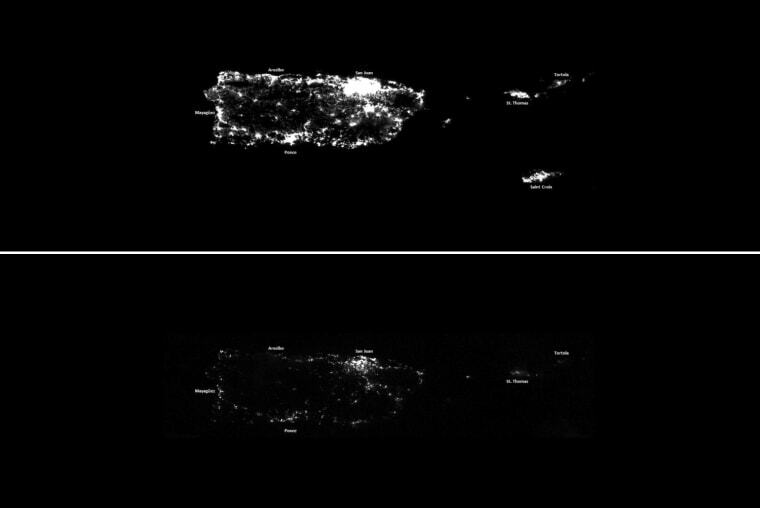 Satellite images show an island devoid of light. Cellular phone service is non-existent. Hurricane Maria's devastation of the U.S. territory of Puerto Rico last week left the entire island and its 3.4 million residents without power. Officials are still only assessing what is needed to kick off a months-long effort to bring back electricity, meaning millions of people could face an extended period without clean water, refrigeration, safe food or medical supplies. Maria struck Puerto Rico as a very dangerous Category 4 hurricane on Wednesday, with winds up to 155 miles per hour, leveling structures across large swathes of the island, killing at least 10 residents and cutting off power and telecommunications services.